We have seen that the City plans to spend $1.27 million to control phosphorus and sediment in Reedy Creek that already are being controlled by the sediment traps at Forest Hill Park Lake. 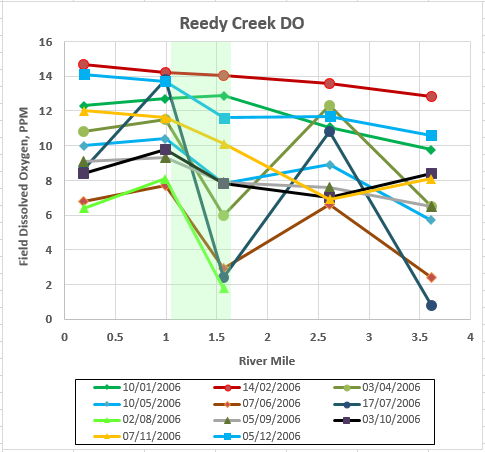 We also have seen the monitoring data from the Reedy Creek Coalition suggesting that the project area in its present condition improves the dissolved oxygen (DO) concentration in the stream. 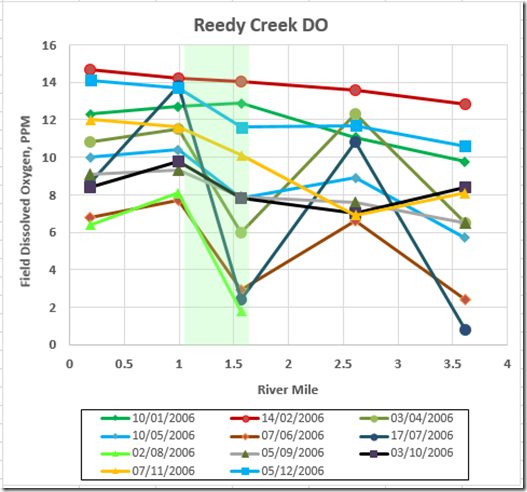 Roger Stewart of DEQ referred me to Kelley West of their Piedmont Regional Office; Kelley most kindly sent me a spreadsheet with DEQ’s monitoring data from the creek. Most of the data are focused on the time variation at one station or another but there is one nice set from 2006 that paints a clear picture of the DO up and down the creek. The project area runs from just above the 44th St. station, RM 1.57 (standing there one can see the bottom end of the concrete channel, built by the City to abate upstream flooding, that ends at 46th St.), to just above Roanoke St., RM 0.99. Also, they do their dates with the day and month reversed from usual; e.g., 17/07/2006 is July 17. The green overlay roughly denotes the project area. In winter, e.g. the red curve for Feb. 14, the flow tends to be high and the oxygen solubility also is high, so the creek looks good all the way down, generally improving a bit after it leaves the concrete channel at 46th St.
Summer is a harder time. Note especially the June, July, and August curves, when the oxygen solubility is lower and the oxygen demanding wastes work at removing what oxygen is in the water. But we see the project area helping the stream recover from a violation of the 4 PPM required by the water quality standard. The Coalition points out that the project would remove the trees that shade the section below 44th St. and thus would make the downstream DO levels worse. So we have a section above 44th St. that is crapping up the stream but the City wants to impair the section at and below 44th St. that already is helping abate the damage caused upstream. If your kid kept tracking mud into the house, would you tear out the rug or would you get the kid cleaned up before he came in the door? By the same token, if the upper section of the stream were causing a dissolved oxygen problem, would you fix that or go mutilate the downstream segment that was helping improve water quality? We know the City’s answer.